"Cross your fingers boys, let's hope it works!" 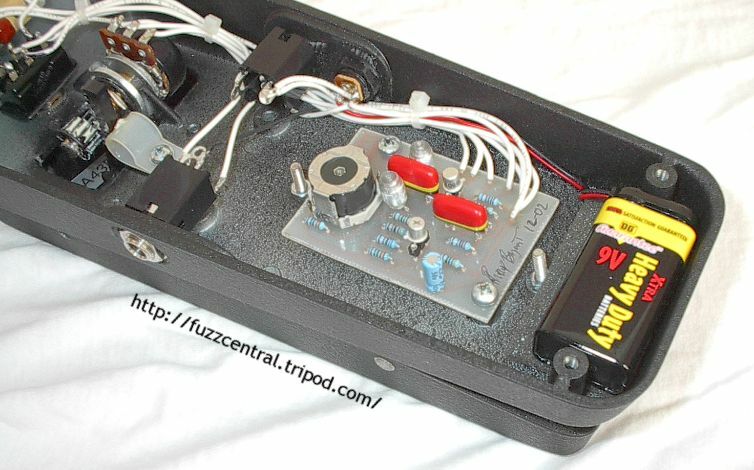 From the research that I've done and the emails that I've sent and receieved, I've generated a list of unique things that appeared in the McCoy and probably in other 1960s wah pedals. This list might not be complete because like I said earlier, parts substitutions were common and so were slightly different circuits. 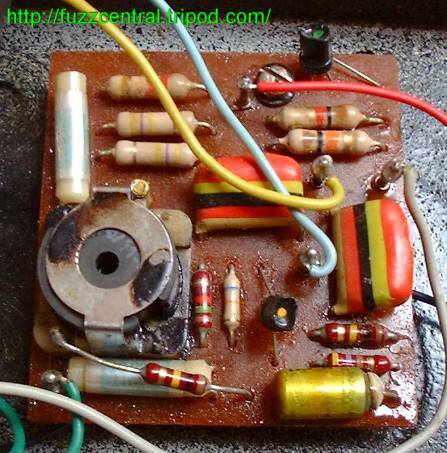 At the input of modern wah pedal circuits the 68K input resistor comes before the input capacitor. In the McCoy circuit the 68K input resistor comes after the 0.01�F input capacitor. This doesn't really make any difference in the sound of the circuit, but is unique to the older wah pedals. The inductor on the circuits that I've seen are Halos, both "large hole" and "small hole" versions. The closer the inductor is to 500mH, the better! There have been reports of inductors other than Halos being used, but it appears that the Halo was by far the most common. The electrolytic capacitor in the circuit is a Ducati 4�F non-polarized instead of the standard 4.7�F polarized capacitors found in other wah circuits. The transistors that were used in 1960s wah circuits were low to medium gain compared to the very high gain MPSA18 transistors that are used in modern wah pedals. The lower gain transistors contribute to more bass in the circuit. The McCoy circuits came with BC109s and BC173s. 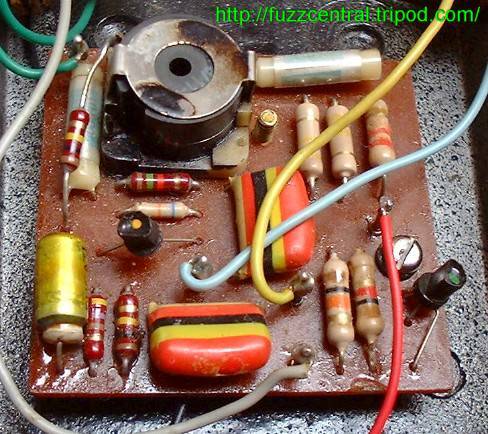 There are probably more transistors that were used in the original pedals also. The 2N3900A was specified as a service replacement for Q1 and Q2 in the circuit. Try some BC109Bs. The taper of the wah pot is important in these circuits. Luckily for all of us, the "ICAR" taper pots are being reproduced these days, copied from an original. The two 0.22�F capacitors in the McCoy circuits that I've seen were "tropical fish" polyester film. I believe that capacitors make a big difference in the overall tone of the circuit, so if you want the circuit to sound as close as possible to the original, you should use capacitors that are very similar to the originals. You can also use a couple of modern 0.22�F metallized polyester film capacitors for performance that's even better than the originals. The part number for two excellent replacements is included in the parts list. The two 0.01�F capacitors in the circuit were Ducati 10000pF (0.01�F) polystyrene with a 125V voltage rating and a tolerance of �10%. These same capacitors were specified for several other wahs. Original versions of these would be very hard to find these days, but luckily Mouser Electronics sells Xicon polystyrene capacitors that should work just fine. Their part number is in the parts list. 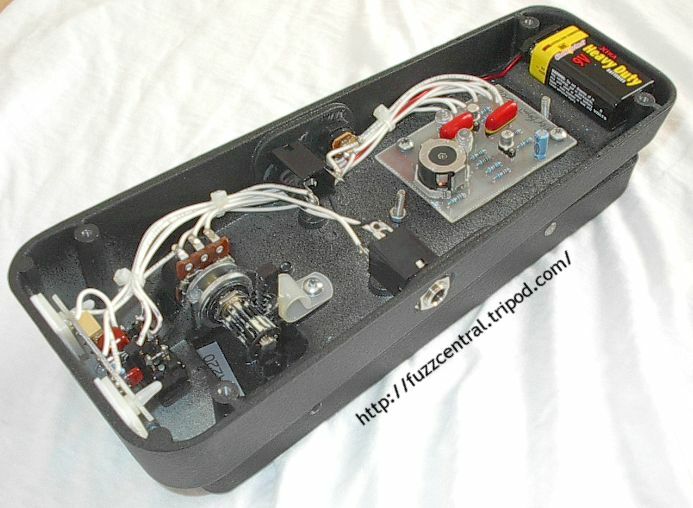 Here is a schematic of the Vox Clyde McCoy wah pedal. It isn't much different than the standard wah pedals is it? There's really no magic in this circuit, just slightly different parts that contribute to a different overall sound. The components and values highlighted in red on this schematic are the parts that made the Clyde McCoy wah different from the others, whether it's their value, their order in the circuit, or the material that they're made from. 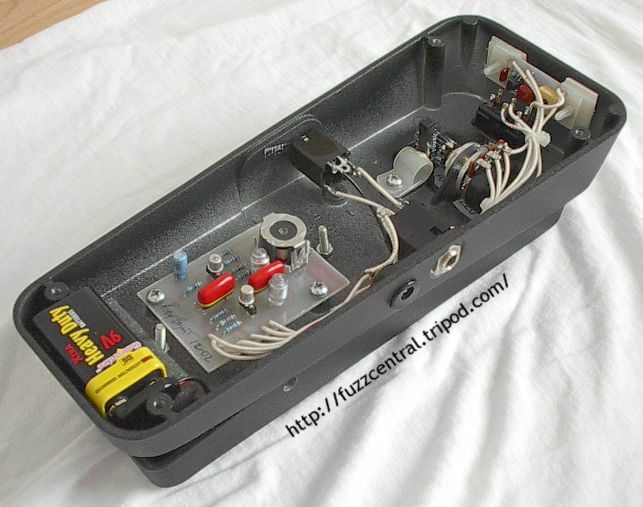 Below are some pictures of an original Vox Clyde McCoy wah pedal. In the pictures you can see the 100K resistor paralleling the inductor (one end of the resistor is soldered directly to one of the inductor's posts), the tropical fish capacitors, and the "small hole" Halo inductor. Also take a look at this Clyde's switch in the third picture. That's an Arrow DPDT, but notice how it's wired...as a SPDT. What gives guys? Special thanks to Stuart Castledine for providing me with these very nice pictures! With the PCB and layout files you can build several different wah pedals, but as you can probably tell from the labelling on the transfer pattern, I originally intended it for the McCoy circuit. The layout will accept Stuart Castledine's Halo replica inductor, which has a lead spacing of 0.4" all the way around, and it will also accept the original inductors from Crybabys and V847s, which have a lead spacing of 0.3" all the way around. The PCB and Layout for the output buffer can be mounted just about anywhere in the wah shell. I usually stick it on the vertical wall at the front of the wah pedal in front of the bypass switch.